Explaining how an archaeologist makes conclusions can be very complicated, but this underwater archaeology activity coaxes students to make the necessary deductions and use the same critical thinking that archaeologists use in the field. First a brief discussion exploring the various ways that underwater archaeology is far trickier than the regular dry land type. Each team member is then given a task, documenting, holding a flashlight, plastic cover remover, or general excavator; then we turn out the lights! 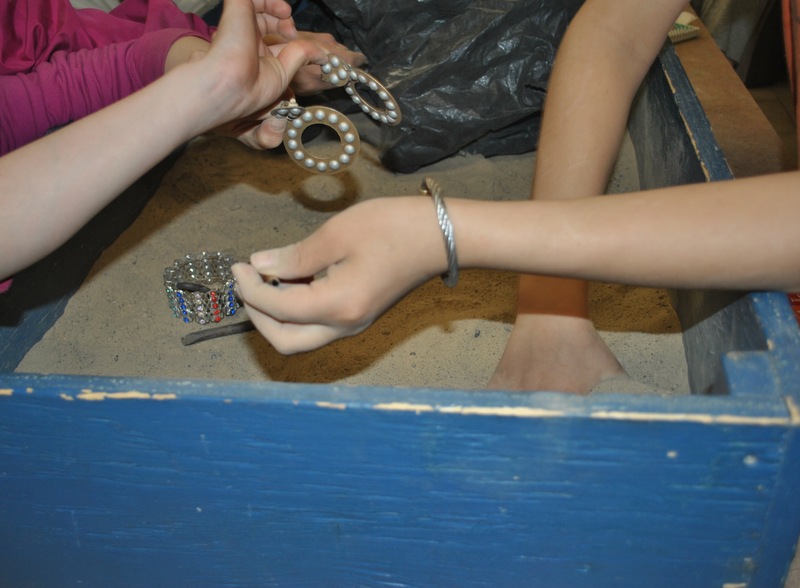 The students explore their ‘shipwrecks’ in teams by flashlight, each shipwreck is contained in a blue box filled with sand and covered by a plastic sheeting to simulate water. Each of these boxes has a different assortment of artifacts, which represent shipwrecks from three different areas of the world and time periods. The students are instructed to explore the artifacts left behind from their shipwreck and to focus on drawing what they see; recording as much of what they can see before they “run out of diving time” i.e. the lights are turned back on, and they must resurface. 1. What are the artifacts you found? 2. What kind of shipwreck was it? It is at this stage that the students, without even noticing what they are doing, utilize their deductive skills and critical thinking abilities to answer the questions. They must think about what they found; what does it look it? Have I seen anything like this before? How do all these artifacts work together? And to make it even more difficult, they must decide as a group on one answer! The teams then switch “shipwrecks” and complete a second excavation. At the end of the activity, we all discuss our findings and compare the answers of each team. Did they come to the same conclusion? Or were their conclusions different? Unsurprisingly, the students are almost always unanimous on the shipwreck of a First Nations canoe; this activity is almost always preceded with a handling session looking at real First Nations artifacts and they are fresh in the students’minds. They find it easy to make the connection between what they saw and learned earlier in the day and what they were finding at the bottom of their blue “water” box. The other two boxes contain an Egyptian ship and an Ontario tourist boat. These pose a greater problem. And some teams conclude the Egyptian ship belonged to pirates, or the tourist boat is the Titanic. There is a trick to the latter, and the students must look closely in to catch it. One artifact in this “Shipwreck” is a small ceramic shoe; on the shoe the words “Souvenir of Niagara Falls” are printed. This little clue means that it is connected in someway to Niagara Falls. Maybe a tourist travelling home from a visit, or maybe even the Maid of the Mist. The body of water, in which this “Shipwreck” was found, would go a long way to answering that question. Ultimately, the students discover that archaeologists know what they know by analyzing the artifacts and archaeological sites for clues, much in the same way a detective would. Today is International Day of Archaeology!